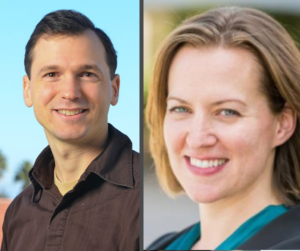 Flash organizations were created by the teams of Stanford professors Melissa Valentine and Michael Bernstein (Courtesy of Michael Bernstein). Stanford researchers have developed a new model for collaborative work — dubbed flash organizations — aimed at making crowdsourcing more structured and thus more effective at solving complex problems. Crowdsourcing harnesses a group of people to accomplish tasks that need a large amount of manpower. Applications of the increasingly popular technique vary widely: A crowdsourced disease research project launched by Stanford scientists, for example, distributes the massive computing power required to investigate protein folding by getting people around the world to run software on their personal devices. Like crowdsourcing, flash organizations also recruit many people in a short period of time, but they seek to move beyond the simple, specific tasks that crowdsourcing outsources due to its reliance on laypeople. Instead, flash organizations draw on a more organized assemblage of experts. In creating on-demand workforces of experts, flash organizations emulate emergency-response crews, assembling people with specific roles rather than just gathering people willing to do any task. That hierarchy of roles allows the people in flash organizations to coordinate smoothly together despite not knowing each other, researchers said. “These organizations are no longer anchored in rigid, Industrial Revolution-era labor models but instead fluidly assemble and adjust, pulling from a globally networked labor force,” said Melissa Valentine ’02, assistant professor of management science. The researchers behind flash organizations have put their concept into practice to create a card game, an app for organizing online workshops and an app to facilitate information-sharing between patients and EMTs. Their paper describing flash organizations’ role in completing each project won Best Paper at the Association for Computing Machinery CHI 2017 conference, held earlier this month. Bernstein, Valentine and their colleagues have created an online platform called Foundry that facilitates flash organizations with tools for hiring, communicating and dividing up jobs. Foundry is not yet available to the public, but the researchers said that some people have already expressed interest in using the tool — not only for flash organizations but, for example, to aid with telecommuting.